The apartment is located in quiet location just a few minutes walk from the lake access. By the south-facing slope offer a magnificent view of Lake Constance from the terrace and the lounges. With upscale amenities, the apartment has a living space of approximately 80 m² and offers comfort for up to 4 people. You reach the apartment through a separate entrance with wardrobe. For cooking invites the fully equipped kitchen. The extendable dining table with leather chairs can accommodate 4 - 6 persons. On the leather couch to relax. And if you want to miss thanks to the Sky subscriptions not the football league, sports events, series and hit movies in HD quality. HD + is also activated for you. The entertainment is rounded off by a large UHD Smart TV, a Bose sound system and free Wi-Fi. The covered with oak parquet bedrooms each have bedside tables, full length mirror and practical wardrobes. In the bedroom with lake view, a double bed is (180 x 200 cm). The second bedroom has two single beds (90 x 200 cm). The high-quality bathroom has a floor-level rain shower, glass shower enclosure, toilet, vanity unit, hair dryer and a lighted mirror. On the large terrace, a table stand with seating for 6 and 2 sun loungers. Through the terrace roof you can sit outside even in changing weather conditions and have in the sunshine always a shady spot. The holiday home has two lying on the ground parking spaces. In a locked garage to park your bikes or sports equipment. In a basement room you will find practical utensils for room cleaning and also enough space for the storage of your suitcases and bags. The light yet sturdy Linder FISHING 440 with Suzuki's driver-less 5 hp outboard can be hired for a fee and is ideal for a family outing or fishing trip. The architectural and energy-efficient house was finished 2016th with heat and moisture recovery increase underfloor heating with innovative individual room control, the central ventilation systems not only your comfort but also protect the environment. The total energy demand is CO2 neutral ensured with green energy, wood pellets and solar thermal. To improve the water quality is a soft water plant. 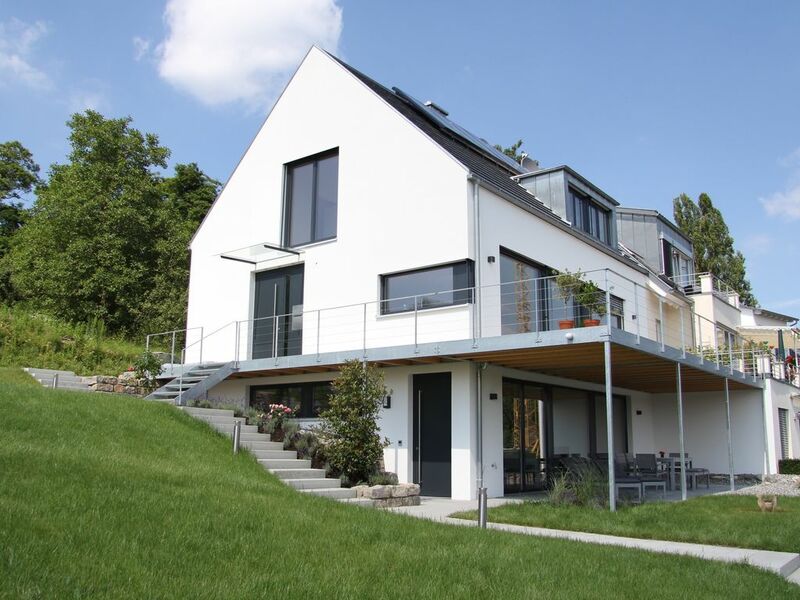 The apartment is an ideal base to explore the Lake Constance region, the Upper Rhine and Switzerland. By boat you can reach the popular destinations Radolfzell, Konstanz, Mainau and Schaffhausen with its Rhine Falls from the landing stage in Wangen. For a day trip also is Zurich. With the guest card you can use the local public transport for free and get discounts on various tourist attractions. Die sehr gut ausgestattete Wohnung läßt keine Wünsche offen. Wir haben u.a. das Frühstück im Freien mit Seeblick in dieser ruhigen Wohngegend sehr genossen. Die Gastgeber sind sehr freundlich und wir haben uns willkommen und wohl gefühlt. Besonders hat uns der Teller Muffins zum Geburtstag unseres Sohnes überrascht und gefreut. Nochmal vi elen Dank. Wir kommen gerne wieder und können diese Gastgeber zu 100% empfehlen. Sehr schöne, moderne und saubere Ferienwohnung in sehr ruhiger Lage mit hochwertigem Komfort und tollem Seeblick. Ebenso konnten wir nette und hilfsbereite Gastgeber antreffen. Moderne und hochwertig ausgestattete Ferienwohnung mit perfekt funktionierendem WLAN, Sky-Fernsehen, in traumhafter und ruhiger Lage. Mit kleinen Aufmerksamkeiten, wie Wasser, Bodenseeäpfeln, leckerem Kuchen wurden wie von unseren sehr sympathischen Gastgeberehepaar in der top gepflegten Wohnung empfangen. Wir haben uns sehr wohl gefühlt und kommen gerne wieder.